An extremely haunting UFO sighting which has well stood the test of time was an event which took place in the Piney Woods of Texas, near the town of Huffman. On the chilly night of December 29, 1980, two women and one child encountered a craft of unknown origin, and all three suffered not only emotional trauma, but severe physical injury as well. A drive through the Piney Woods of Texas at night is a lonely, somewhat spooky one to begin with, but on this particular night, a routine drive turned into a life-changing event for these three people. Fifty-one-year-old Betty Cash was driving through the woods traveling from New Caney to Dayton on Farm to Market road 1485. Riding with her was her friend, Vickie Landrum, fifty-seven-years-old, and Vickie's seven-year-old grandson, Colby. They were looking for an open Bingo game, but found all of them closed down for the Holiday season. They stopped for a meal at a restaurant, and then continued their journey. Soon, the three began to see a light in the distance, and in a few short minutes this light became a glowing object, slowly crossing the tops of the tall pine trees. The area that they were in was densely occupied by pine and oak trees, surrounded by occasional swamps and small lakes. As they proceeded along their way, their initial thought was that the object was an airplane or helicopter from one of the airfields not too distant from their location. Suddenly, ahead of them loomed an immense diamond-shaped craft, which was hovering over the road ahead of them! At regular, fast intervals, the object would shoot down a stream of reddish-orange flames. Vickie would later describe it as being "like a diamond of fire." Being a devout Christian, she had never believed in UFOs or extraterrestrials, and at this moment, she believed that she was witnessing the end of the world. They could also hear a constant beeping sound as the strange craft spit out its fiery downspout. Frightened, Betty came to a quick stop to keep from running under the craft. The car's heater had been running to kill the frosty air of the night, but now the inside of her vehicle was so hot she had to turn off her heater, and leave the car, along with Vickie and Colby. Now outside of the vehicle, they could hear a steady roaring sound coming from the frightening sight ahead of them. 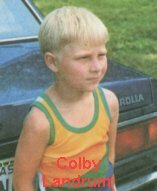 Young Colby became so afraid that his grandmother took him back into the car to comfort him. Betty stayed outside. In some strange way, she was fascinated with the almost unbelievable vision before her. As she stood watching the craft, suddenly the sky was full of helicopters. Betty said, "They seemed to rush in from all directions... it seemed like they were trying to encircle the thing." She assumed that they were from Tomball Airfield, northwest of Houston, or Ellington Air Force Base, south of Houston. The eerie object now began to lift into the air, and proceed to the southwest, with helicopters in pursuit. As Betty returned to the car, the door handle was so hot she could hardly open the front door. Her hand was burned getting inside. She immediately turned on her air conditioner to cool off the inside of the vehicle. After the object had left the area, they restarted their vehicle, hoping to get home and never see the craft again. But after several miles of dark highway, they left the Farm to Market road in favor of the freeway. Ahead in the distance, they could again see the object with its bright lights illuminating the helicopters which were still trying to encircle it. At this vantage point, the two ladies could actually count the number of copters in the air, 23. Some of them they identified as the double rotor CH-47 Chinook; the others were the faster, single engine rotor type, which they thought were Bell-Huey. After a fast trip home, all three of the witnesses became extremely sick within the next few hours. Betty's head and neck were blistered, and soon her eyes were swollen shut. She was also terribly nauseated. By the next morning, she was almost in a coma. Vickie and Colby suffered very similar symptoms, yet not as severe as Betty's. After a couple of miserable days being cared for at Vickie's home, Betty checked into a hospital where she was treated as a burn victim, remaining for 15 days. Her hair began to fall out, and her eyes swelled so badly she could not see for about a week. Colby had problems with his eyes, and Vickie was losing her hair also. In addition, her scalp was numb and painful. All three of the victims were treated for radiation poisoning, and their condition was listed by doctors as life-threatening. Before long, skin sores developed, weight loss began, and skin cancer was diagnosed. As to the origin of the helicopters, local air bases were questioned, but would not admit to sending any helicopters out that night. The only public statement made by military officials came from Fort Hood press officer Major Tony Geishauser. In an interview with the Corpus Christi Caller newspaper, he stated that no Fort Hood aircraft were in the Houston area that night. "I don't know any other place around here that would have that number of helicopters," he said. "I don't know what it could be... unless there's a super secret thing going on and I wouldn't necessarily know about it." The black top road was badly damaged by the emissions from the craft that night, but it was very quickly repaired. Investigators were at a loss to explain the events of that night, except to say that Betty, Vickie, and Colby had encountered a craft of undetermined origin, or possibly an experimental government craft. The three unwilling participants in this event sued the U.S. Government for medical damages, but during a congressional hearing, the Department of the Army Inspector General denied any military involvement in the case, and disallowed any compensation for the three unwilling participants in the Piney Woods affair. An off duty Dayton, Texas policeman and his wife who were driving home from Cleveland the same night and saw a large number of CH-47s. A Crosby, Texas man who was directly under the flight path, reported seeing a large number of heavy military helicopters flying overhead. A Dayton, Texas, oilfield worker Jerry McDonald saw a large UFO fly directly overhead while he was in his back garden. He thought it might be a blimp at first, but soon knew it was something more sinister. "It was kind of diamond-shaped and had two twin torches that were shooting brilliant blue flames out the back," he said. He saw that it had two bright lights on it and a red light in the center. In a freaky circumstance of luck, corroboration of the unknown object of that night would come in 1981. In April, a CH-47 flew into Dayton for the purpose of a public showing. This allowed local residents to view the machine, both inside and out. Colby spotted the helicopter as it was flying into town, and became very upset. Vickie took him to the landing site, hopefully to allay his fears. As they reached the Chinook, a long line of locals had already formed, waiting to see the giant machine. When their turn finally came, Vickie and Colby entered the helicopter. Accompanied by another visitor in addition to Colby, Vickie began to recount her experience in the Piney Woods. Vickie and the other unnamed witness both claimed that the pilot said he had been in the air the night of the traumatic sighting. He was sent to check on a UFO that was in trouble near Huffman! Vickie began to discuss her injuries due to the burns and radiation poisoning. Upon hearing her confession, the pilot quickly clammed up, and moved them out of the craft. The pilot was later found by the UFO group VISIT. He would only admit that he knew of the Cash/Landrum case, but refused to admit that he had been in the area the night of the sighting. 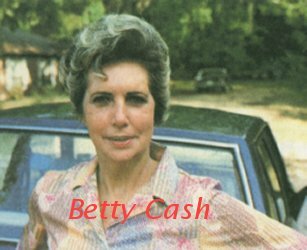 Betty Cash, one of three people injured in a UFO close encounter near Huffman, Texas, on December 29, 1980, died on the 18th anniversary of the event, in Birmingham, Alabama. She had been in poor health ever since the encounter. At the time of the event, Mrs. Cash operated her own businesses near Dayton, Texas. Betty Cash, along with Vickie Landrum and grandson Colby Landrum, encountered a huge UFO accompanied by military helicopters on a dark road in the east Texas Piney Woods. They were exposed to radiation from the object, which caused extreme medical problems such as burns, eye damage, hair loss, diarrhea, and vomiting. Although they and others observed a large number of military helicopters along with the UFO, the U.S. Government refused to acknowledge the event or assist them in any way. After the encounter, Betty Cash was hospitalized and treated for burns and the other maladies. The extent of the injuries was so great, she was forced to close her businesses and never worked again. He life became a series of hospital stays, many of them in intensive care. Eventually, she developed cancer, which was successfully treated. In November 1998, Mrs. Cash suffered a stroke. On December 29, during her recovery, an unusual turn of events claimed her life. Mrs. Cash was a hero in the fight against government UFO cover-ups and brought hope to other victims of UFO incidents. 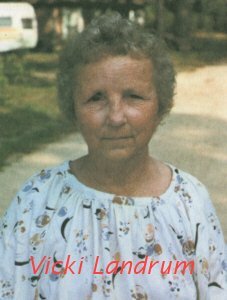 She was devoted to family and friends and never allowed her illness to prevent her from helping others to cope with the trauma of UFO close encounters. Betty Cash will be missed... but never forgotten. 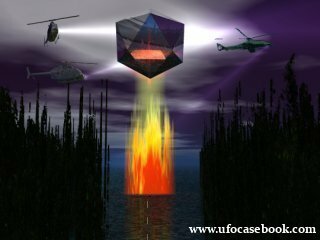 In 1981 I represented three People in a lawsuit against the United States Government for injuries that resulted from their contact with an unusual aerial object. Betty Cash, Vicky Landrum and Colby Landrum are the only three People to ever sue our government for injuries from a UFO. On the eighteenth anniversary of her encounter, Betty Cash died. Betty Cash was a warrior and heroine. She fought the US government and, even in defeat, showed a spirit and tenacity that will now be her epitaph. CAUS and I pay tribute to a very brave lady... and a victim of this government's callousness to the rights of the individual. Betty Cash and Vicki Landrum were interviewed in 1981 at Bergstrom Air Force Base. The UFO Casebook has a transcription of this taped session.